Turecamo Coastal and Harbor Towing Corporation was foundeded by Bartholdi Turecamo, who immigrated from Isola Lipari, a small island between the northern coast of Sicily and the southern tip of Italy. As an immigrant Turecamo found work in road construction around New York. Turecamo began his own road construction company. It is reported that at one time the company was doing a number of marine related jobs and utilized a company called Gallagher towing. One one occasion Gallagher Towing was late retrieving a barge of material for Turecamo. Barney Turecamo called him to complain and Gallagher claimed the tug was on the way, then slammed the phone down (which did not hang up) Gallagher then reported to said to someone in his office "Screw that Italian S.O.B we will get there, when we get there." Supposedly, Barney Turecamo over heard this and the next day acquired his first tug. 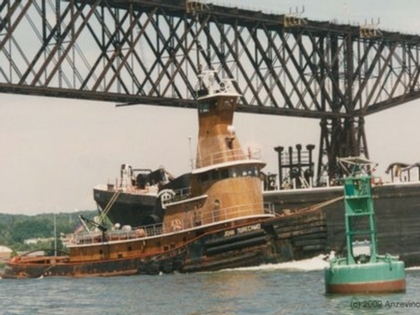 In 1927, the company acquired their own tug to haul road stone from the wharves in Manhattan to his plant in Brooklyn, New York. His son, Bart Turecamo added more tugs and expanded the operation into the New York Harbor trade. The third generation, Bart Turecamo Jr. succeeded his father, who died in 1983. In 1978, Turecamo acquired the White Stack from Wayland T. Coppedge Jr., who had previously sold his Jacksonville, Florida based company, Florida Towing Company, to the Moran Towing Corporation in 1976. The wood grain paint job was a distinguishing mark of a Turecamo Tug, although a number of other tug companies in the harbor had similar wood grain paint jobs also, such as Dalzell. Turecamo was the last company in New York harbor to have wood grained boats. There was a small group of shore side painters that would do that work. First a base coat was applied and allowed to dry then a color coat over that. The color coat would be combed with steel combs of varying length and sizes of the individual comb points. The individual doing the work would twist and bend the comb as he pulled it through the wet top coat to create the wood grain effect. Giving the paint an authentic wooden look when completed. Above the hand rail it was a light color grain and dark below. The handrails around the middle of the deck house were painted red and a stripe covered any area without a handrail. Once it was all completed the grain job would be covered with several coats of spar varnish, which would protect the paint. Usually each spring the varnish would be sanded lightly and another coat applied. Towards the later days of the company newer boats joining the fleet were painted a buff color and the older boats were painted the same buff instead of receiving a new grain job. In the summer of 1998, Turecamo Maritime and their affiliated company, The White Sack Maritime Corporation merged with the Moran Towing Corporation of Greenwich, Connecticut. Moran then added Charleston, South Carolina to their thirteen ports of service on the East Coast and Gulf Coast. The Moran Towing Company of Charleston, South Carolina is the successor company to White Stack Maritime Corporation, which has had a presence at the port of Charleston since 1882 and was also aquired by the Moran Towing Corporation as part of the merger.